Joel Peresman, president and CEO of The Rock and Roll Hall of Fame Foundation, had a simple motive for pursuing a career in entertainment management. 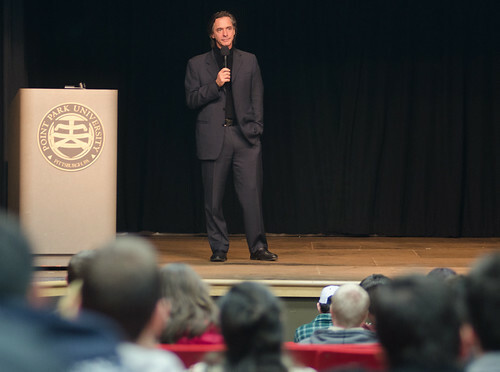 "I wanted to get into concerts for free," he told more than 100 Point Park students at a presentation hosted recently by the Department of Sports, Arts and Entertainment Management. A Pittsburgh native, Peresman has achieved that goal and much more. In addition to his current role, his experience includes positions with the William Morris Agency, International Talent Group, Madison Square Garden and Radio City Music Hall. ITG represented some of the largest touring acts in the world, including Pink Floyd, Duran Duran, Peter Gabriel, Genesis and The Cure. At the Rock and Roll Hall of Fame Foundation, Peresman leads media deals, sponsorship, marketing and fundraising. He also serves as executive producer for the annual artist induction ceremony broadcast on HBO. However extraordinary his career path, Peresman started where many people do - at an entry-level position. While home on break from the University of Texas, he looked for help wanted ads from Pittsburgh concert promoters. He arrived at the offices for DiCesare-Engler Productions and - after introducing himself to Ed Traversari, who now serves as associate professor for the University's SAEM program - told co-founder Rich Engler he would "do anything to get into the business." Hired as a security guard, Peresman worked on and off for the renowned promoter during breaks and "saw there was a real business in it." After graduation, he accompanied his father on a business trip to New York City. A conversation with a tie salesman led to a meeting with the salesman's cousin - legendary lyricist Sammy Cahn - who picked up the phone and called Lou Weiss, head of William Morris Agency, who hired Peresman to work in the mailroom. The secret of his success? "A lot of hard work, help and luck," Peresman said, urging students to take risks, seek opportunities and stay in touch with colleagues and competitors throughout their careers. "Music is a big business but not a very big community," he said. "The relationships you make are important. Keep at it. It's not an easy industry but it's constantly evolving - and it's fun." Adam Valen, a junior SAEM major from Pittsburgh's Taylor Allderdice High School, appreciated Peresman's reminders that "everybody starts at the lowest end of the totem pole and works their way up." "In addition to perseverance with your work and work ethic, networking within the music industry and almost any industry is vital and crucial," said Valen, who calls Ed Traversari his "selling point" for choosing Point Park. Max Kovulchuk, a senior SAEM major, agreed that Peresman's talk illustrated the value of drive. "He was very persistent throughout his career and it obviously paid off. Great opportunities will pass you by if you don't act on them," said Kovulchuk, who aims to work in the music industry as either a band manager or for a record label in artist and repertoire (A&R).